Aimee O’Neill and Julie Paik. Photo: Trish Davies. For all the ambition of Rowen Fox’s first full-length opera, the labour could not obscure the love. 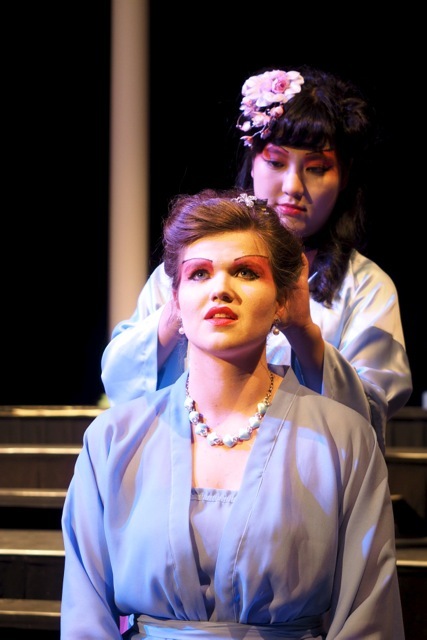 In the myth of the Chinese moon goddess Chang’E he has hit upon subject matter ideal for operatic interpretation. It provides a context for him to broaden his compositional palette with Chinese-spiced textures and melodic motifs, and a context in which to escape the more avant-garde dictates of modernity and be free to create music that can attempt to soar free of earthbound gravity. In the latter endeavour he often succeeds, most notably providing some gorgeous material for soprano Aimee O’Neill in the title role: music that is simultaneously celestial and impassioned. Fox conceived of a story that is essentially a sequel to the accepted Chinese mythology surrounding Chang’E, the libretto being penned by himself and Diana Baric. Essentially it is about the cycles of life: new moon leading to old moon, summer to winter, life to death. When Chang’E awakens at the new moon she has forgotten the phases that have gone before, except as a dream, and must relive the joy of falling in love with the Divine Archer and sun god Hou Yi (tenor Joshua Oxley) all over again, just as she is doomed to repeat the agony of losing him. Love and loss: what could be closer to the core of the operatic tradition? And it is a tradition from which Fox borrows freely. One catches echoes of Mozart in the recitative, Puccini in the arias, Chinese opera in the ritual and a newness of his own devising in the fusing of cross-cultural elements and the scoring. Yet in his desire to maintain a shadowed ethereality that is appropriate to a work set upon a silvery benign moon, a certain sameness of mood, texture and tempos often smooths the surface of the unfolding drama, just where one senses there should be ripples of varying intensity and velocity. It is some time into what is called Part One before the first major musical change occurs with the first arrival of male voices, and then of humour with the admirable character of Old Yue (baritone Tristan Entwistle), the old man of the moon. Entwistle stood out with underplayed physical humour and clarity of delivery. Indeed most of the time the libretto was extremely hard to catch, and surtitles should be considered in any future fully-resourced production (this one being privately mounted). The ensemble, with Tristan Entwistle right of centre. Photo: Trish Davies. 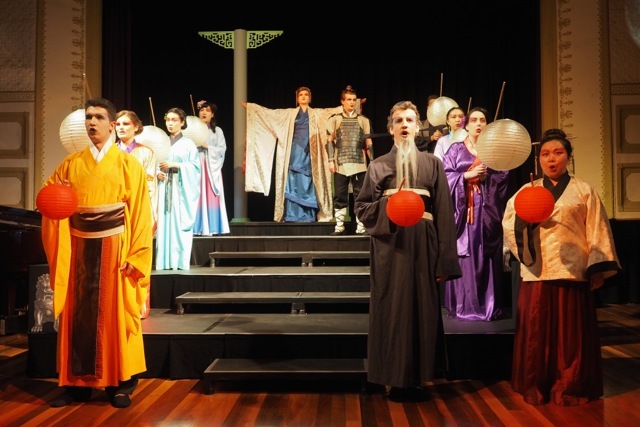 Oxley was vocally effective but theatrically wooden as Hou Yi. One did not feel either the drama or music truly flare up with the passion of their love. The double-whammy effect of this was that nor did we feel the agonising wrench of Chang’E’s desolation when he departs, and so the pivotal loss/hope emotional roller-coaster did not work as it should. Among the other players Michaella Ye Zhang was well cast as Mother Pearl, Julie Paik caught the effervescence implicit in Nightingale (her soprano voice notably robust, if somewhat harsh on occasion), and among the ensemble (in a total cast of 11) Lei Dai exhibited a singular and charming stage presence. Fox has scored the work for a little orchestra of three strings, three woodwinds, French horn, piano and percussion, and has included a ravishing feature for viola to mark a passage of time in Part Two. The absence of a bass and the presence of a vibraphone both contribute to the music feeling airy and appropriately ephemeral, sometimes jarred by the use of woodblocks, while gongs tie the music to the mythology. Despite the smallness of the ensemble, sometimes it felt as though the orchestrations could be starker to create contrast or to shine a fiercer spotlight on the words. As well as conducting, Fox also directed the production, which had commendable costumes on a no-doubt limited budget by Lauren Cass, and the glorious touch of a slowly evolving projection of the moon (by Desiree DeKlerk and Keith Keen), from the merest sliver of a new moon to full and back to nothing. But it is a nothing replete with hope of the returning new phase, and similarly Fox’s ambitious work not only deserves but demands to be aired again, albeit with a little excavation and tampering.